Following the success of our first drop-in session in April, The Mix in Wantage town centre is again hosting a gaming session on Saturday from 10.30 am until 2 pm. Once again, members of the club will be providing games and teaching people how to play them. There isn’t very much space so we won’t be playing long games, in any case, the idea is to show people what modern boardgames are all about by demonstrating shorter games. 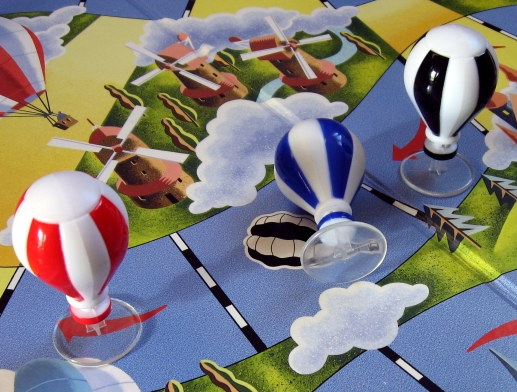 We will bring a few eye-catching games like PitchCar, Riff Raff, Bamboleo, Boom Boom Balloon, Toc Toc Woodman, and Saturn, but most of the gaming will be smaller filler games like Dobble, Turf Horse Racing, No Thanks!, Walk the Plank!, Love Letter, The Great Balloon Race and some of our other light favourites. We will also be bringing some of the classic gateway games like Carcassonne, Ticket to Ride, The Settlers of Catan and Jamaica as well as a small number of deeper games, just to show people what else is out there. This entry was posted in News, Other Events and tagged Bamboleo, Boom Boom Balloon, Carcassonne, Dobble, Jamaica, Love Letter, No Thanks!, PitchCar, Riff Raff, Saturn, The Great Balloon Race, The Settlers of Catan, Ticket to Ride, Toc Toc Woodman, Turf Horse Racing, Walk the Plank! on November 18, 2015 by nannyGOAT. The Mix in Wantage town centre is a community space that can be booked for use by local groups, organisations, businesses and individuals for activities, fund-raising, meetings, workshops, and presentations etc. This spring, we held a drop-in gaming session there to try to inspire people to play games. With winter approaching (traditionally “the gaming season”) and Christmas on the horizon, it seemed an excellent time to do it again. We will be there from 10.30 am until 2 pm on November 21st 2015. There isn’t an awful lot of space so, as before, the idea is to encourage people to drop in and play a short game or two, so we will be bringing along some of most eye-catching games like PitchCar, Colt Express, Dobble, Turf Horse Racing, Cube Quest, The Great Balloon Race and maybe a few of our favourite winter themed games like Snow Tails, Carcassonne: Winter Edition and The Great Downhill Ski Game. 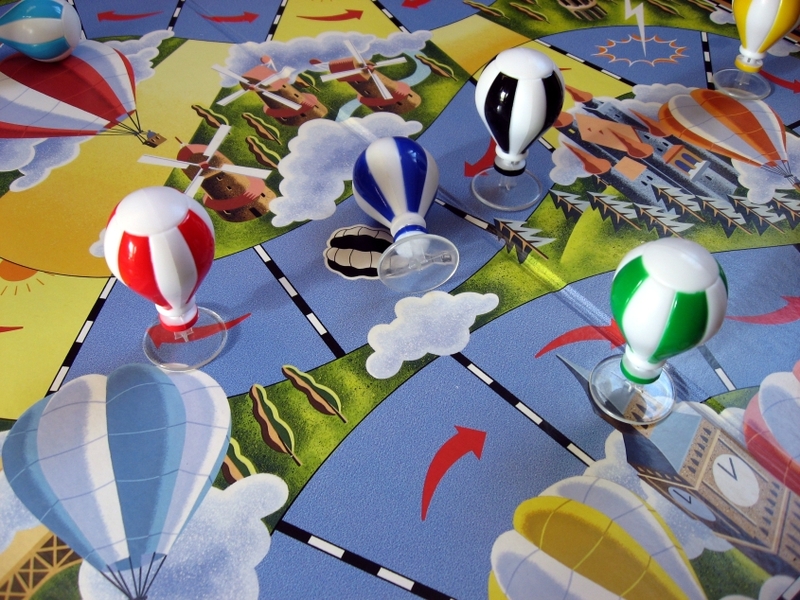 This entry was posted in News, Other Events and tagged Carcassonne: Winter Edition, Colt Express, Cube Quest, Dobble, PitchCar, Snow Tails, The Great Balloon Race, The Great Downhill Ski Game, Turf Horse Racing on September 25, 2015 by nannyGOAT. The drop in gaming session at The Mix in Wantage was a great success. It started quietly, but there were lots of new people there and lots of games were played. Green arrived first and was setting up tables when Blue and Pink arrived. By the time the first punters arrived PitchCar, Riff Raff and Camel Up had been set up and other games were out ready to be tried. Before long Purple and Black had also arrived and there was a steady stream of games being played including Toc Toc Woodman, Escape: The Curse of the Temple and Cube Quest, and a steady stream of pieces flying across the room. Old favourites like Dobble, Incan Gold, The Great Balloon Race and Carcassonne also got an outing as well as the Lego game, UFO Attack. Thanks to everyone who came, both visitors and gamers – it was great to see it so well attended. Everyone seemed to enjoy themselves, so it’s definitely something we’d be interested in doing again in a few months time. This entry was posted in Other Events and tagged Camel Up, Carcassonne, Cube Quest, Dobble, Escape: The Curse of the Temple, Incan Gold, PitchCar, Riff Raff, The Great Balloon Race, Toc Toc Woodman, UFO Attack on April 18, 2015 by nannyGOAT. The Mix in Wantage town centre is a community space that can be booked for use by local groups, organisations, businesses and individuals for activities, fund-raising, meetings, workshops, and presentations etc. For four days a week The Mix is used as a ‘hot desk’ area for local people to use as a space to work from in town, however, Saturdays and evenings are available for local groups and community events. We will be holding a gaming session from 10.30 am until 2.30 pm on April 18th 2015. There isn’t an awful lot of space so the idea is to encourage people to drop in and play a short game or two, so we will be bringing along things like PitchCar, Riff Raff, Dobble, Turf Horse Racing, No Thanks!, Walk the Plank!, The Great Balloon Race and some of our other favourite filler games. This entry was posted in News, Other Events and tagged Dobble, No Thanks!, PitchCar, Riff Raff, The Great Balloon Race, Turf Horse Racing, Walk the Plank! on February 5, 2015 by nannyGOAT. The first game we played this week was our “Feature Game”, the card game, Saboteur which is a little like a cross between two games we’ve played before: Avalon and Incan Gold. In this game players are dwarves working together mining for gold, with the catch that there could be a saboteur in their midst… Since nobody had ever played it before, the first round was a bit of an experiment for all of us and we all started out “honest” playing path cards and maps. However, suspicion arose a when one player claimed to have run out of useful paths and had to play a broken pick-axe, with inevitable reprisals. Unfortunately, he HAD been honest and there were no saboteurs, but as we just managed to get to the gold, it didn’t really matter. Next, we played the Scandinavian Ticket to Ride, a game we were all reasonably familiar with. This is a really beautiful edition of “the train game”, but with slight twists to the usual rules. White and Purple took the first few points, but Black joined in quickly and play continued pretty much evenly. Black ran out of trains first which stymied Purple’s attempt to get the long track into Murmansk, however, we were all within ten points or so when we went into the final scoring. Unfortunately, it turned out that Black and Purple had accidentally conspired to block White making her take a sizeable detour. This had consequences for the number tickets she could complete. Black and Purple jointly took the Globetrotter bonus with five completed tickets each, but it was the magnitude of the completed tickets that made the difference and Black ran out the winner by some fifty points. Finally, we squeezed in a game of Ice Flow. This is a really pretty strategy game where players direct teams of three explorers that are trying to get from Alaska to Siberia, climbing pack-ice, dodging polar bears, catching fish and occasionally jumping in for a quick swim. Although this is a new game to boardGOATS, we were all familiar with it, so with a quick reminder of the rules we were off, jumping from ice floe to ice floe. The game has a bit of a tendency for players to get stuck unable to get fish or rope, but we were wise to this and managed to control the resources quite successfully. Black got an explorer home first, followed by a couple of Red meeples, however, while Black’s last piece dodged a hungry polar bear, Red managed to get his final one home for the win. Learning Outcome: A clever move can sometimes be mistaken for a guilty one, however much you protest. This entry was posted in Games Night and tagged Ice Flow, Incan Gold, Saboteur, The Great Balloon Race, The Resistance: Avalon, Ticket to Ride, Ticket to Ride: Nordic Countries on May 15, 2013 by nannyGOAT. 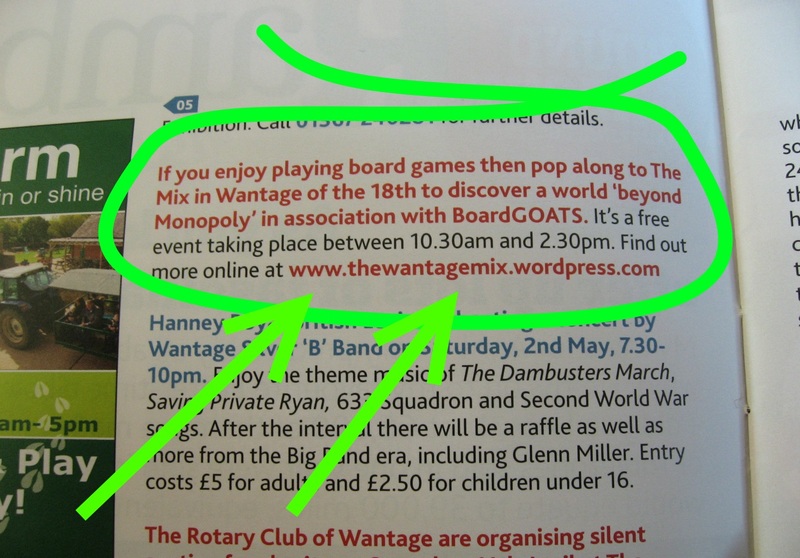 It was billyGOAT’s birthday and he decided that what he really fancied was a day playing games with his mates. So, on a slightly damp afternoon in December, friends from far & wide converged on Challow Village Hall. The first game up was a six player game of Pillars of the Earth. This turned out to be a rather long game and took most of the afternoon. However, since it was one of billyGOAT’s choice games, it was fitting that he ran out the worthy winner. Meanwhile, games of Discworld: Ankh-Morpork, Riff Raff, Apples to Apples Kids, Dixit, Hamsterrolle, The Great Balloon Race, Ramses Pyramid, Bohnanza, Incan Gold and Shopping List all went on as the masons slowly built their cathedral and the children played with the Scalextric and decorated biscuits. Shortly after 6pm, everyone sat down together for a meal of Chinese takeaway (including dumplings) which was followed by a marvellous Jamaica Cake for those who had any space left. Then, the games recommenced with parallel games of Lord of the Rings and Formula D while games of Billy Biber (aka Log Jam), Dobble (aka Spot It!) and Loupin’ Louie kept the children occupied until it was time for them to go home to bed. Unfortunately, Lord of the Rings had to be terminated prematurely and the Fellowship failed to make it to Mordor. Despite its apparently poor reputation to the contrary, the six player game of Formula D on the other hand finished in timely fashion and players moved on to a quick nine player game of The Resistance: Avalon. With a lot of new players everyone was a little quiet and Mordred’s Minions won easily. By this time, the numbers were beginning to dwindle a little, but there was still time for a quick six player game of Roman chariot racing with Ave Caesar where everyone competed to show due respect to the Emperor. billyGOAT’s horse, “Dobbin”, made a very slow start, however, it managed a late charge for the line eventually coming second behind “Glue-pot Boy”, who had led from the off. The last game of the night was another game of Avalon, this time with only seven players and victory went to Merlin and the Loyal Servants of Arthur. Then we had to tidy up the kitchen, sweep the hall and hand the keys back. A good time was had by all and everyone went home tired, but happy. Finally, many thanks to everyone who helped out in the kitchen during the event, and kept food and drink flowing, while others played; it would not have been possible without them. This entry was posted in Uncategorized and tagged Apples to Apples Kids, Ave Caesar, Billy Biber, Bohnanza, Discworld: Ankh-Morpork, Dixit, Dobble, Formula D, Hamsterrolle, Incan Gold, Jamaica, Loopin' Louie, Lord of the Rings, Pillars of the Earth, Ramses Pyramid, Riff Raff, Shopping List, The Great Balloon Race, The Resistance: Avalon on December 16, 2012 by nannyGOAT.